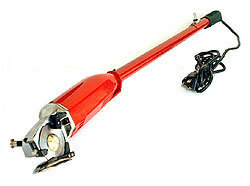 Portable Electric Rotary Cutter with built in push button blade sharpener and finger guard with 24" Long Handle. The AS100LH is streamlined with a lightweight construction which helps eliminate operator fatigue. Equipped with either a round blade for general use or a hexagon blade for sheer or difficult to cut cloth, the AS100LH has longer reach than competitive models. Ergonomically designed grip-actuated on/off switch. High torque motor cuts the heaviest goods with ease. Includes: EXTRA SET OF BRUSHES, REPLACEMENT BLADE, and SPARE COUPLING.